Acquiring Open Water PADI certification in Vietnam was one of the coolest things we did in SE Asia. Scuba diving invited us into a completely different world, a world we loved so much! Since our first dive we knew that from then on it was and is “our thing” that we will pursue to our best ability. After Vietnam we went to the Philippines where we dived at the Palawan islands among shipwrecks and after that we headed to Borneo. Imagine our surprise when reading about the best dive sites in the world we found out the top of most lists was in Borneo- around Sipadan Island! What a lucky coincidence we thought already having flights to Borneo. After reading about people’s experiences and looking at the jaw-dropping pictures we realized that we just HAVE to go there! Once this goal was set there was some research needed. • Since 2005 Sabah National Park instituted a permit system therefore the amount of people is limited to 120 per day. • It is recommended you book the permit ahead of time. • If you are doing everything “right” and trying to book ahead it is very pricy since you are offered package tours. Needless to say, the permit system as well as very high priced package tours discouraged us. The prices I am talking about are roughly 550 dollars per person being the cheapest option. It is 4d/3n package with only 4 dives at the Sipadan Island and 9 dives at the other islands. So for us it would cost 1,100 dollars for 4 days, plus we would have had to organize a babysitter for all these days. Nevertheless, it wouldn’t be us if we didn’t try to find a better option. Keeping our heads high we decided to conduct a “field research” and see what is actually going on in person. We flew to Kota Kinabalu, did a 2-day trip to Brunei and took a night bus straight to Semporna, the closest city from where you can organize your dives to Sipadan. Once in Semporna we started visiting different agencies (and there are very very many) to collect information. • You do need permit and there are only 120 people allowed to dive per day. No jokes, no bribes. • The price for 1-day dive is around 800 Malaysian ringgit ($180) per person. It includes equipment, lunch and transportation. We arrived on Monday and the next 2 available permits were for Saturday. We booked them immediately and left Semporna to explore Kinabatangan River and the Orangutan Sanctuary. We organized our 1-day diving experience at the Sipadan Island with Uncle Chang. They have some sort of website, but it is mostly useful for contact information. We personally found them by recommendations of another local company. I want to highlight that “big” companies, among which is Scuba-Junkie, were not helpful at all. On the contrary we were told that no company organizes 1-day dives here and if we want to see Sipadan we’d better buy a package. Assholes. Why am I saying this? So that you don’t get easily discouraged if people lie to you, just keep on looking. You never know when fortune will smile upon you. Those who follow this blog know that we travel with our baby girl Lia. By the time we arrived to Borneo she was just 11 month old. In order to be able to dive we had to find a babysitter. It wasn’t as easy as we thought however everything turned out even better than we expected. Read more about finding a babysitter in Semporna here. • If you decide to follow our lead and venture to Semporna without booking a permit ahead of time, check whether it is holidays and high or low season. We went to Borneo in March 2016 (end of low season) so it wasn’t crazy yet and we’ve got luck getting two permits. • Before doing any other activities at Borneo (Kinabatangan river, Orangutan Sanctuary, Mt Kinabalu) secure you permit in Semporna. You might need to wait a whole week or more until the next available permit. As expected, the more time you’ve got the more chances you have to get a permit. • Try to plan as many days as possible in Borneo, in case you get your permit right away, there is just so much to do on the island! 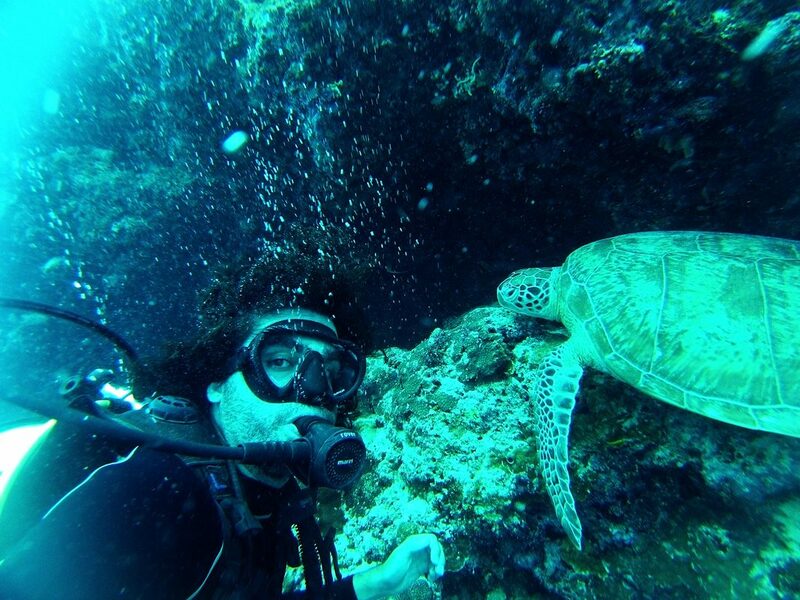 • While waiting for a permit you can discover many other islands at the Sipadan Barrier Reef that do not need permit. 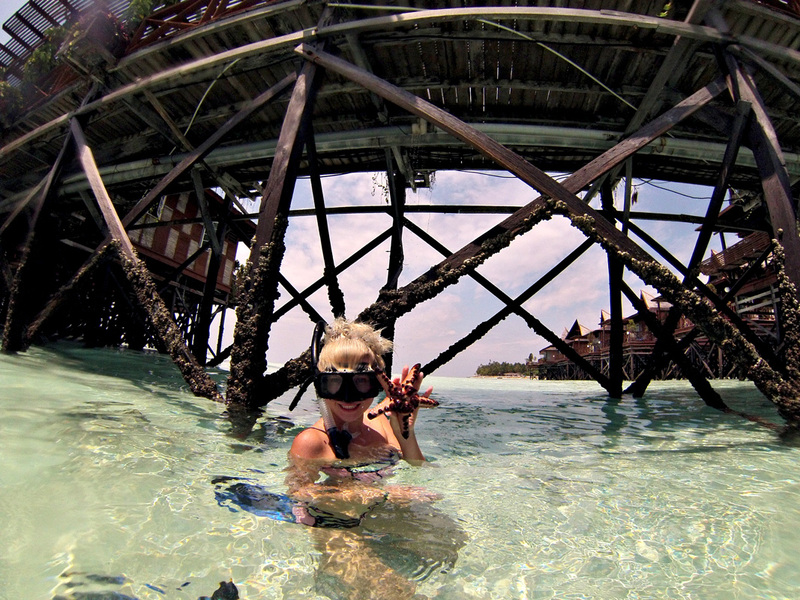 We spent one day Snorkeling at Mabul island and it was mind-blowing! • There are cheap hotels in Semporna that are not listed on any online website so look around for a good deal. • Keep in mind that most cheap hotels don’t have good Internet or no Internet at all. • Be persistent and don’t let others to discourage you. Simply stunning. It was worth trying and trying and not giving up! Huge turtles, sharks, schools of barracudas including the famous tornados they make, not to mention fantastic corrals and just so much fascinating and diverse marine life! It was one of the most memorable experiences throughout our entire trip in SE Asia! I hope this post will help more travelers like us to discover this untouched piece of paradise! If you want to find out more about traveling Borneo click here here. Check out this barracuda tornado!